Preventing back injury in the workplace. In 2006, injuries related to lifting, pushing, pulling, holding, carrying, or throwing cost businesses $12.4 billion in direct costs, according to the 2008 Liberty Mutual Workplace Safety Index. In fact, it can cost an individual employer up to $65,000 for a single back injury. AirOlift Lifting Systems, an Akron, OH-based builder of ergonomic material handling equipment, has been working with some of the nation's largest most proactive companies to prevent operator back injury while benefiting from higher, more streamlined production, and quick ROI. One such company is 3M, a global, diversified technology company, which produces thousands of imaginative products with the goal of making life easier and better for people around the world. Jim Joreski, a maintenance supervisor at 3M's Medina, Ohio plant, says that the goal of improving plant operator health, safety, and production was hatched a decade ago. "At the time, lifting, handling, and packing heavy, pressure-sensitive rolls of consumer labels for shipment at the plant was very labor intensive," says Joreski. "Workers might handle a couple hundred rolls per shift, each ranging from 50 to 250 lbs., which could wear them out or expose them to potential lift injury." 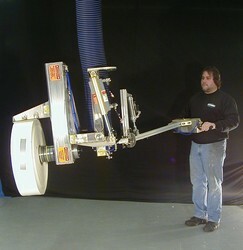 The plant turned to a pneumatic assist device made by AirOlift Lifting Systems. The lift-device specialist tailored a lift with an attachment for gently handling rolls in a range of sizes without damage. The specialist stayed on-site at the plant during installation, start up, and initial training, which taught best practice use of the equipment for efficient operation and injury prevention. After buying its first pneumatic lift assist device about a decade ago, the plant has added several more over the years. "Since installing the equipment, we've eliminated lift-related injuries in that part of the plant process," says Joreski. "Productivity is up about 40 percent over the previous method, and there's no problem with operator fatigue or repetitive motion injury." Joreski appreciates the safety features built into the equipment. For drop protection, for instance, a series of sensors assure the load cannot be released until it's placed. If there's ever catastrophic air loss, the device slowly lowers items held to the ground, protecting operators and eliminating product damage. Because the system is all pneumatic, operated by a single shop airline, it eliminates electric hazards such as shock from frayed wires. It also avoids running costly electrical connections in the working area. "From higher productivity alone, a study showed payback on our AirOlift equipment in about two years, but payback could be immediate if it prevents even one back injury," says Joreski. "It has saved wear and tear on our people and boosted morale." The original lifting device purchased for the plant keeps on working a decade later, with virtually no unscheduled downtime or maintenance, according to Joreski. "We've had no breakdowns or drop problems," he says. "It's a workhorse that helps our operators lift product as safely and productively as possible. I can't imagine operating without it." AirOlift Lifting Systems custom manufactures product clamping, vacuum material handling equipment, ergonomically designed to meet or exceed OSHA and NIOSH mandates or recommendations. Its lifting solutions enhance safety and production in a variety of industries on items ranging from bags, boxes, parts, panels, rolls, doors and windows, to clean-room/wash-down applications. For more info, call 800-605-8612; Fax 610-824-8063; visit http://www.airolift.com; or write to AirOlift Lifting Systems at P.O. Box 26126, Akron, OH 44319.